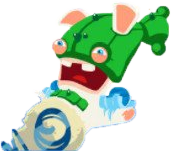 This article is about the enemy in Mario + Rabbids Kingdom Battle. For the actor of the same last name who played President Koopa in the Super Mario Bros. film, see Dennis Hopper. 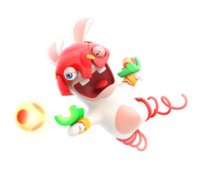 Hoppers are Rabbid enemies in Mario + Rabbids Kingdom Battle. They behave similarly to Ziggies, but with higher HP and small guns on their wrists. They are identifiable by their oddly shaped masks and springs on their feet. Instead of Dash attacks, they can increase their movement range with Team Jumps, using the springs on their feet to bounce off of their allies' heads. All variants except the Garden Hopper can deploy a protective shield that negates the damage (but not the Super Effects) of one attack; additionally, they can perform up to two Team Jumps per turn if their allies are in range. There are five Hopper variants, one for each area. Garden Hopper: Encountered in Ancient Gardens, this Hopper variant has a tattered red mask and 90 HP. Its wrist guns seem to be made of green Warp Pipes, with Spiny shells as ammunition. Sherbet Hopper: Encountered in Sherbet Desert, this Hopper has 135 HP. It wears a cactus-shaped mask and furry pants, and its wrist guns are covered in ice and inflict Honey status. 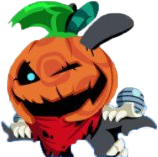 Spooky Hopper: Encountered in Spooky Trails, this 205 HP Hopper appears to be undead, with a dark body, glowing blue eyes, a red scarf, and a pumpkin-shaped mask. Its wrist guns appear to be bone themed, with a chance to inflict Push. Lava Hopper: The final Hopper variant is encountered in the Lava Pit, with a charred appearance, a gas mask, a Bowser Jr. bandanna worn like a cape, and 310 HP. It has wrist guns resembling Bowser's spiked bracelets, which can inflict Burn on contact. Tropical Hopper: This Hopper variant from Donkey Kong Adventure wears a coconut-made mask with tropical leaves, and has 110 HP. Its wrist guns seem to be made of coconuts, which can inflict the Bounce Effect. It can also inflict the Vamp Super Effect on anyone within their landing area when performing a Team jump (similar to the Valkyrie's Ground Pound), making this Hopper variant the only non-boss enemy that can inflict two Super Effects. Chase Range None Tertiary Technique Team Jumping Jerks! This page was last edited on February 22, 2019, at 16:29.